(Nanowerk News) Chemists at Tufts University’s School of Arts and Sciences, collaborating with PerkinElmer and UCL (University College London), have witnessed atoms of one chemical element morph into another for the first time ever—a feat that produced an unexpected outcome that could lead to a new way to safely treat cancer with radiation. The research appears in Nature Materials ("Enhancement of low-energy electron emission in 2-D radioactive films"), online in advance of print. Scientists led by E. Charles H. Sykes, Ph.D., a professor of chemistry at Tufts and senior author on the paper, worked with iodine-125—a radioactive isotope that is routinely used in cancer therapies. 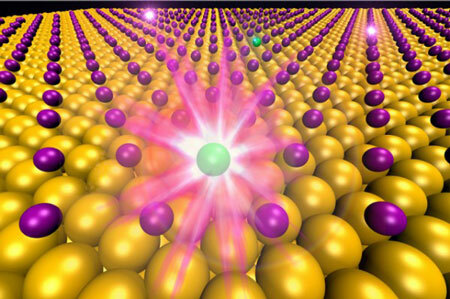 Using a scanning tunneling microscope, which can produce images of each atom in a material’s surface, they observed individual atoms of iodine-125 decay. As each atom decayed it lost a proton and became tellurium-125, a non-radioactive isotope of the element tellurium. In this simulation, the purple balls represent radioactive iodine-125 atoms on a gold surface and the green balls are atoms that have undergone nuclear decay into tellurium-125.